Express your gratitude with this dual handled gift basket in soft leather, brimming with gourmet confections and perfectly savory pairings. Godiva Chocolate, English Toffee Caramels. Gourmet Caramel Popcorn, Cinnamon Almonds. Ceramic Thank You Mug, Roasted Coffee and more. Each gourmet item is carefully assembled and artfully arranged inside this gift. 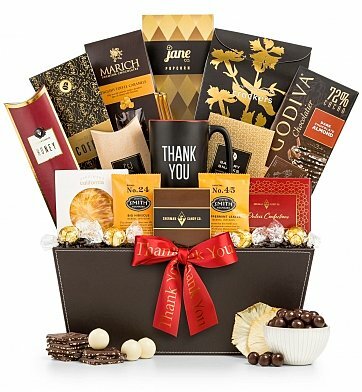 The basket is accentuated with a hand-tied "Thank You" printed ribbon, or the personalization of your own choosing at an additional cost. Complimentary scissors are included so your recipient can easily open their gift. Your gift will leave a lasting impression as they repurpose this elegant leather tray with dual handles and contrasting stitching. Measures 14" x 13" x 10". A Thousand Thanks is a hand delivered gift. These gifts are delivered by one of our local design centers located throughout the United States and Canada. Same day delivery is available for most gifts when ordered before the cutoff time. The cutoff time for A Thousand Thanks is 2 PM in the recipient's time zone. California Crisps Natural Pineapple SlicesA perfect blend of pineapple's sweet flavor and freshness, these naturally dried slices have a perfect texture and the burst of sweetness is simply amazing. Ceramic black thank you mug, gourmet goodies and tea. Choose a red satin Thank You ribbon, or personalize your own! I want to extend my sincere Thanks to all of you who work so hard to make our gift giving so easy. I have had great experiences with both the service and products. Simple yet classy. Very good selection of items. Dressed it up with a few candy canes just because it is Christmas Time. got a lot of variety, enough treats for a teenager to share with a class of her friends. the basket was tastefully put together and the personalized ribbon and scissors was a nice touch. Recipient was very impressed by the gift. I understand there were scissors on the outside of the package to help get you into it..:) They said they will be using GiftTree for their gifts in the future! Nice job! Although I personally have not received one of these beautiful gift baskets. (hint) I took a chance several orders back and the recipients have called me to say "Thank You" and really appreciated the gift. All saying how beautiful and professionally done they were. I was also very impressed how fast they were delivered to the door. Will definitely use again. Great gift and easy process. I ordered this item for multiple clients and had them shipped directly to each client. Gift tree made this process easy to track shipments and confirmed delivery. Everyone was very complimentary of the gift. Will definitely use them again. I sent this to a past Real Estate Client who recently sent me a referral. They loved it! Beautiful gift and easy to order and have delivered. Saved me a lot of time not having to go buy something and hand deliver it. My customer absolutely loved it! The presentation was fantastic, in fact, I ordered another basket because it was so well received. I stubbled across GiftTree after browsing the Internet. They have the best deals, shipping and presentation. Plus, everyone loved it and posted pictures on how nice it looked! I will not go anywhere else. Thanks GiftTree! My customer was very so I am very happy!!! I received this gift from my Secret Sister a month ago, and every item is awesome! I am so impressed with her thoughtfulness! My friends felt spoiled by this basket, which couldn't have pleased me more, and the speed in shipping was MUCH appreciated! A perfect solution for this situation, very excited to do business with you all again. My wife was impressed and thrilled with the gift. It had a little of everything she liked, and loved the basket it came in. Excellent Thank You Gift Basket! Easy to order and purchased at a great price. The recipients loved it! Will definitely order through GiftTree again! We submitted this gift to our new loan lender. They absolutely loved all the different items and were impressed with the gift. Would definitely recommend this to anyone that wants to submit this as a business gift. I sent this to my Auntie! It was a great gift. We normally use a gift company in Australia but they don't delvier to the USA. My very special friend sent me this gift basket for my Birthday. I just opened it and I am very, very, very impressed with the quality of the basket and the taste of the products. This is my new favorite place. Thanks! Shipped promptly, fair price, lovely arrangement. My client loved the gift basket! It was a lot of goodies for a reasonable price and delivered on time. I appreciated the email confirmation of shipping and delivery, too! The basket was delivered on time and it looked great. The cost was good for the amount of goodies that were in the basket. The big downside to the basket, was that the card that I wrote was not attached to the basket. The recipient had no idea who it was from. I finally had to call to make sure that the basket was delivered. GiftTree is a wonderful company with superb service. I appreciate the selections, prices, and the promptness of their deliveries. Thanks so much. Your products continue to delight people. Thanks! I enjoy giving GiftTree items. The quality and service are exceptional. Thank you again. The recipients were very pleased.